Charming pixie face stickers accent memos, envelopes and gifts with a cheery smile for the day! Generous set of 144 features 4 different expressions; 1 1/2" diameter. Pixie stickers make fun accents to letters! SEAL MY ENVELOPES WITH THESE AND FUN USES. I like anything fun and new, I've ordered these stickers before, these bring on "My Happiness" nowadays we all need more smiles and happiness in our lives. "Boy is that ever the truth !" These stickers are so very cute and practical. Perfect for brightening up someone's day. I love them. As a cashier, I love giving something to my young children who come through my line! Sometimes the not-so-young even ask for them! This is a fun item to use on gifts, cards etc. This wll brighten up your day!!!!!!!! Using to cheer folks up! I like this product. Would buy it again. These little faces usually brings a smile to people and are fun to use. Stick them on all outgoing mail to grandkids, give them sheets of them in birthday cards, etc. These fun stickers can be used to encourage everyone from children to adults. Everyone needs a smile everyday! I like to decorate my mail and since these were on sale I treated myself to them. Besides who can resist a smiley face and these are very cute. Pixie Stickers put just the right touch of cheer on the many notes of encouragement I mail. Even the youngest recipients who are just learning to read see the sticker and know who sent the letter. Pixie Stickers are a delightful product. I draw my birthday cards for 173 people, 64 are family, and fr anniv. and most of the cards have cartoons drawings,so sometimes the little smilies faces just put the finishing touch to the card. correspondences ~ they are positive and sunny ! I want folks to have a "happy & positive"
reaction when they get a correspondence from me ! They are so so cute. Bought as a gift for a friend....she loves them! 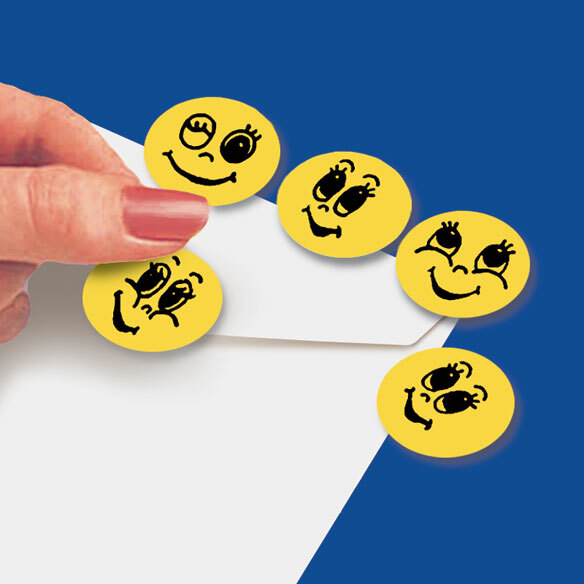 I use these happy face stickers on my letters and cards. My sister says they brighten her day when she receives my letters. Great way to dress up your mail. LOVE THESE. I USE THEM ON OUTGOING MAIL AND FUN APPLICATIONS THROUGH THE HOUSE. Post on envelopes I send my cards out in. Makes everyone smile when they get the card. Bet the mailman even smiles. I still write checks to pay bills. I also love to send greeting cards. These funny faces make the task a little more fun and I hope the reciepient gets a hoot out of the winking faces!! I know it brings a smile to my face every time I use one! Could use a few different expressions on the faces. I am a person that still mails out card and letter to others. They need an extra smile when they get the mail. Love to Happy people smile. Should Get at least 500 Faces. I am a pen paler...and love to decorate my letters with stickers. These would be great for a teacher who likes to put a sticker on a child's paper. Four great pictures of "Smiles". Easy peel and good stick. Great deal! I put them on letters to friends to brighten their day. I thought it would be cute to add to the back of my envelopes that I send out. I just wanted to make people smile. Love the cute faces. Just need to be a little larger. they are OK. I should enjoy using them. I haven't used them yet but I intend to seal newsletter edges with them. I like to put a seal on the closed envelope. I hope a smiley face brightens the recipient's day. This is a nice product for the kids to play with. I made wonderful magnets out of them. Extremely good quality for the project I needed them for.. This was purchased for a gift, so I can't explain what they are like until the person I am giving them to lets me know about them. larger than expected, not the same that was on display and not the right, left smile grin as shown on the display. No wink in the eye either, but will work ok. I wanted something cute to put on the back of envelopes. They are positive and happy little round yellow faces. I left to put them on all my mail I send out. Hopefully they will cheer someone up whose not having a very good day. I love them!!!!! Fun Greeting Stickers to send to my friends and make them Happy ! I love stickers! Yes I am a senior who loves stickers. To send a smile through the mail. These are so cute! I hope they bring a smile to the person's face that receives mail from me! Granddaughter loves stickers. I bought them for her. THESE WILL MAKE MY Letters and Cards so much fun. I put these on my calendar reward for walking 3 miles per day. I need compression hose for my health and just found the stickers cute! I have large vinyl bingo and number sheets that I use colored sheets with these faces over the numbers particular using in a game. I am in charge of bingo in my senior resident dwelling giving them some fun and smiles!! !